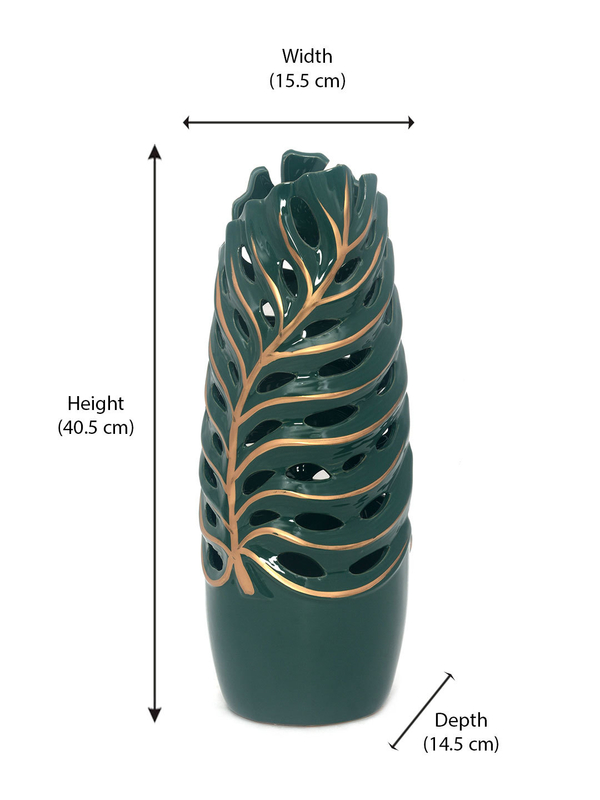 Presenting the Wild Flower Tall cutwork vase emerald which can brighten your space with its aesthetic color combination and you can make it look more astonishing by adding a bunch of flowers to it. This vase would go perfectly with bland colored walls and can add a fancy look to your room. If you have a plain boring room with no decor, then you can add this vase in that room to jazz up the decor. The only thing which you need to ensure is that you Don't keep the place crowded otherwise the beauty of this vase won't be seen by the viewer. If you want to place it in your room, then a nook in the room is perfect for placing with bright lighting near it. Don't place this vase in kids’ room as it can break if fallen by mistake. This tall vase can keep large stemmed flowers in it which can bring a different look to any of the room. The emerald color the vase adds a contemporary look to the room and that's why this vase is perfect for decorating any of your rooms. Get the Wild flowers tall vase from @home.